A palm card designed for the 2018 Sexual Assault Awareness Month campaign. April is Sexual Assault Awareness Month, a time when many journalists cover sexual violence from a variety of news angles. 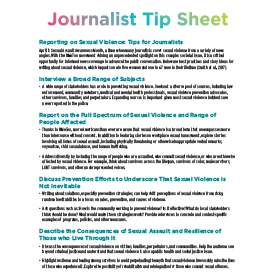 The Journalist Tip Sheet contains best practices and story ideas for writing about sexual violence.